Author Crystal Senter Brown has appeared in Redbook Magazine, Vibe Magazine and Essence Magazine been a performance poet for most of her life. Born in Morristown, TN to a bass-playing Baptist preacher and a painter, Crystal was introduced to poetry at the age of six. 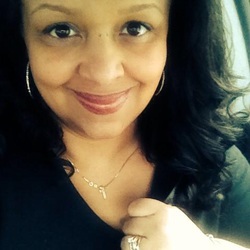 Crystal is a 2014 Massachusetts Arts Council Fellow and has published four books: But you have such a pretty face, Gabby Saturday, Doubledutch and The Rhythm in Blue, which is currently being turned into a feature film. She is currently working on the second Gabby Saturday book (Daddy Saturday, 2014) and a new novel: Leaving Bean Station. The sequel to her novel The Rhythm in Blue (Bloom, 2014) will be released later this year. When she's not writing, performing or saving the world, she lives in New England with her husband Corey and son Adonte. Illustrator Janice Treece Senter was born in East Tennessee and has since lived throughout the Southeast as an Fine Artist and Childhood Artist Educational consultant. Self taught, Janice has worked with of the best and brightest of Fine Artist throughout New England and the Southeast. Mostly known throughout the Northeast for her command of illustration, Janice has began to experiment with abstract and non-traditional forms of painting and sculpting since the mid 1990’s. 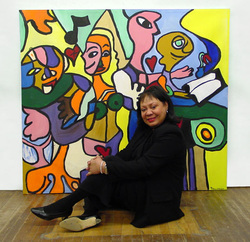 As an artist of African-American, Native American and Caucasian decent, Janice has drawn on her unique experiences growing up in East Tennessee during the late Fifties and early sixties.